English sparkling wine producer Nyetimber and Plymouth Gin have teamed up with Searcys at the Gherkin to create a pop-up celebrating summer. The Seaside in the Sky pop-up will run in London for six weeks from 24 July until 1 September, and will recreate the Great British seaside, with decor to include candy-coloured beach huts, deckchairs, blue skies and a fishing boat. 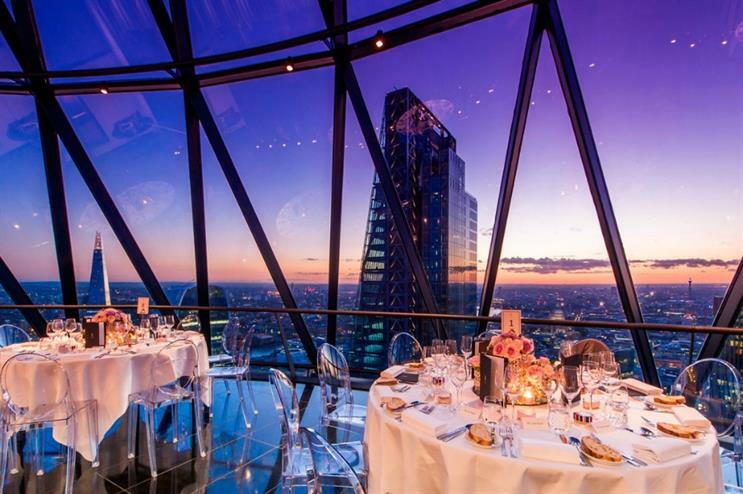 Searcy's at the Gherkin executive chef Barry Tonks will create a summer menu, with dishes including fresh seafood, gourmet fish and chips, beef wellington, a selection of British charcuterie, pork pies and a showcase of British cheese. Nyetimber will be celebrating sparkling wines produced in England's very own vineyards, with visitors able to enjoy panoramic views from the Beach Hut bar or Coastline pop-up restaurant. Guests to the Beach Hut bar also have the chance to revel in summer’s long evenings with a special allocation of Nyetimber Classic Cuvee Jeroboams and vintage Magnums. Guests to the Coastline pop-up restaurant will be welcomed with a Nyetimber trolley and invited to enjoy Nyetimber’s collection of celebrated sparkling wines, expertly paired with seafood by the Searcy’s team. The pop-up will also feature a cocktail menu crafted in partnership with Plymouth Gin, the oldest working gin distillery in England. Summer cocktails, inspired by the Pilgrim Fathers and the Mayflower voyages,will include classic Plymouth Gin martini and gimlet through to a summer glass reflecting the flavours and ingredients of the trading routes explored by vessels departing from Plymouth harbour. The pop-up will be available for private events and is offering both lunch and dinner sittings. Nyetimber hosted guests on board a Routemaster bus at last year's Cowes Week, while Plymouth Gin staged a winter cocktail experience last November in partnership with restaurant and bar Rivington Shoreditch.